After a thorough check, Qoovee.com became a verified member of the ePayments international payment system, headquartered in London, Great Britain, having proved itself as a reliable partner with great prospects. After confirming all the necessary data, Qoovee became eligible to conduct international financial transactions through the ePayments system. What features does this give to Qoovee users? From now on, users can participate in the Qoovee.com affiliate program and earn money by recommending services of the Qoovee e-commerce platform from anywhere in the world. 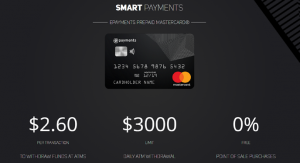 Also, users of Qoovee can order a prepaid ePayments / MasterCard with free delivery around the world, which allows to withdraw the earned funds in any country and at any ATM where MasterCard operates. In addition, the card can be used in stores for paying without commission. Payment system ePayments on the market since 2011. The headquarters is in London, UK. Well-known brands like: Vkontakte, Aviasales, eCommerce, ad1, admitdad, etc. conduct business with ePayments. As it is mentioned on the official website of the ePayments company in accordance with the UK electronic money act law of 2011, the financial controller (FCA) authorized ePayments Systems Limited (license 900172) to issue electronic money. ePayments fully conforms to the strict FCA rules, including requirements for security capital, security of operations, protection of confidential information and insurance of cash. Cooperation with ePayments will allow Qoovee to expand and launch new services, and most importantly to encourage its active users and supporters from around the world.